With summer winding down, stores are overflowing with parents frantically shopping for school supplies and back-to-school wardrobes, running the kids to the doctor for physicals, and, in most cases, bracing them for the necessary vaccinations. But school children aren’t the only ones in need of immunizations at this time of year. Senior health is a top priority this time of year as well. Older adults should also be reviewing medical records with their doctors, and as needed, rolling up their sleeves. To the Rescue home care has the following tips. Throughout the aging process, our bodies’ natural immune systems become less efficient, placing older adults at an elevated risk for contracting viruses such as the flu or pneumonia. As a matter of fact, these two viruses together comprise the 7th leading cause of death for those over age 65 in the U.S. Ensuring appropriate immunizations are given to protect against these viruses can protect seniors from them, or at the very least, lessen the severity of them, potentially saving lives. In spite of myths to the contrary, both flu and pneumonia vaccines are safe. In fact, fewer than 1% of those receiving these immunizations experience fever, muscle aches, and/or local reactions. It’s also important to note that it’s impossible to contract the flu from flu shots, which are made with a dead virus. And the flu vaccine has proven to up to of 90% effective in healthy older adults. 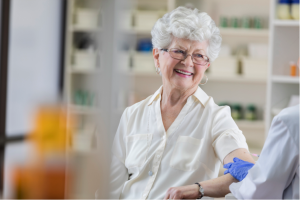 Additionally, many seniors have never been vaccinated for tetanus, diphtheria, or pertussis – or, it’s been too many years for previous vaccinations to still be effective. This immunization, also referred to as DTaP, should be received every ten years. Finally, although many older adults were vaccinated against chickenpox as a child (or contracted the virus) a booster is still needed to prevent against shingles, which can present later in life and cause a great deal of pain and discomfort. As we grow older, the risk of developing shingles increases, with 50% of shingles cases being diagnosed in those over age 60. Download the CDC’s free Adult Immunization Scheduler to keep track of your loved ones’ vaccinations and to ensure they’re fully protected as they age. To The Rescue can help in a variety ways with vaccines for seniors as well as those of any age, by providing transportation and accompaniment to doctors’ appointments, monitoring of seniors and children after immunizations to watch for any potential side effects, friendly companionship to help alleviate any fears, and much more! Contact us at 720-851-2100 in Colorado or 319-826-6068 in Iowa to learn more.